itsAlyx: Day 3: Nürnberg, Germany & Prague, Czech Republic. Day 3: Nürnberg, Germany & Prague, Czech Republic. Happy Wednesday! Hopefully everyone is doing just splendid! I know I'm feeling pretty lazy and lethargic myself. Hopefully you all are doing a little bit better than me! Ooohh... I almost forgot. I'm guest posting over here. You should go read about my wedding mishaps! Seriously... all the cool kids are doing it. Anyway... on to the fun stuff. Day three. Wednesday. 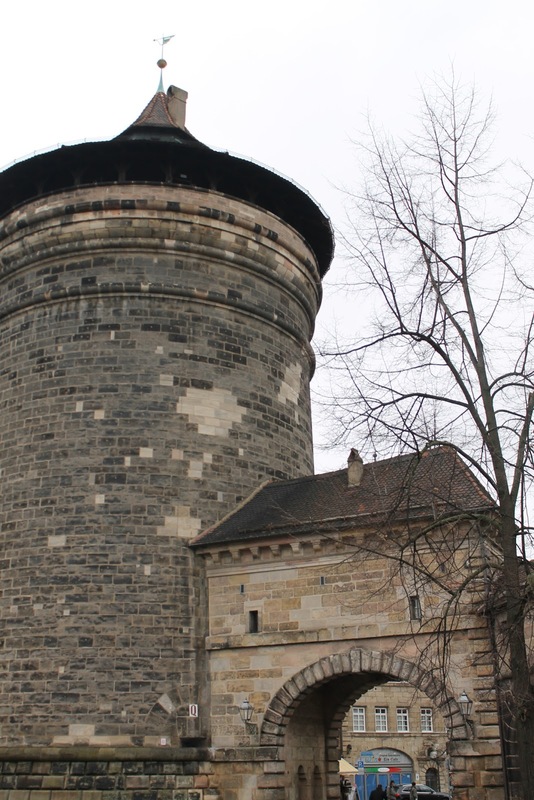 Nürnberg (Nuremberg) and Prague. 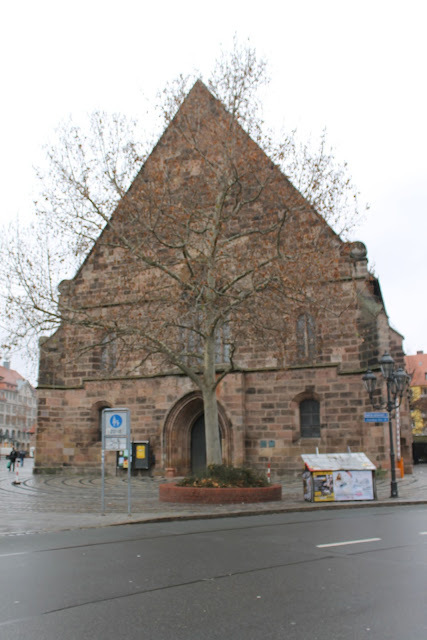 The day started off in Nürnberg with a quick trip to the bakery - some croissants, cheese bread, jelly filled donuts, and Belgian waffles, and we were energized enough to survive the 10-minute walk to the Altstadt (old city). 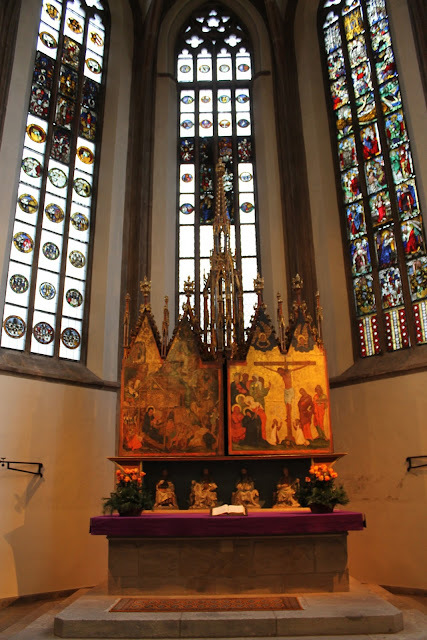 Once there, we spotted a pretty awesome church, and decided to go inside (read: it started to rain, and we noticed a conveniently located church nearby). We spent a bit of time warming up wandering and admiring, then decided to head further into the town to get a bite to eat. 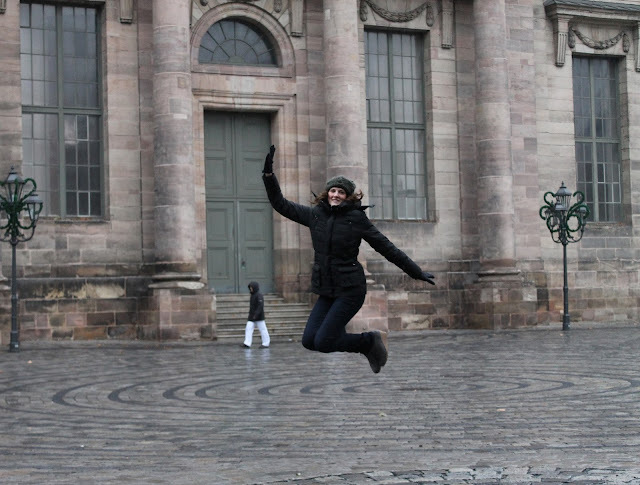 Oh, and to stop and spend 15 minutes getting a good jumping picture for this here blog. As we left the church, we thought we were going to kill our hunger pains, but then Hubby saw an amazing church (he has a thing for old churches), so naturally, we went inside and killed about an hour. Anyway, we eventually made it to a delicious Italian restaurant where I ate the most delicious calzone known to mankind. That's also where I scored this little picture (I think it's kind of cool). 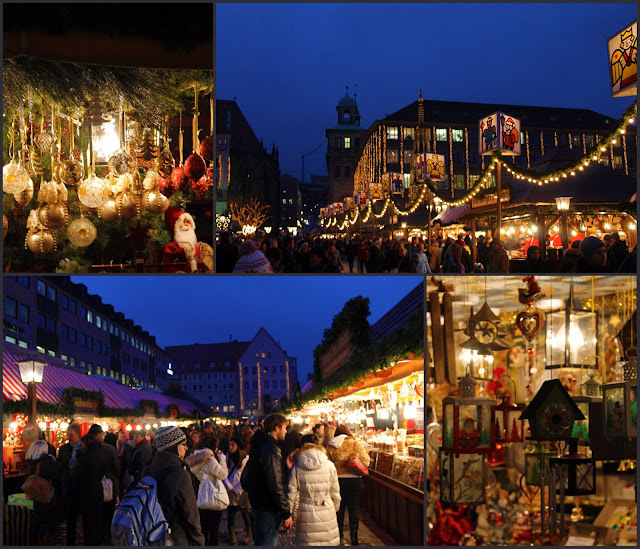 As soon as we were done filling our bellies with deliciousness, we headed over to the Christmas Market (supposedly one of the best in the world). 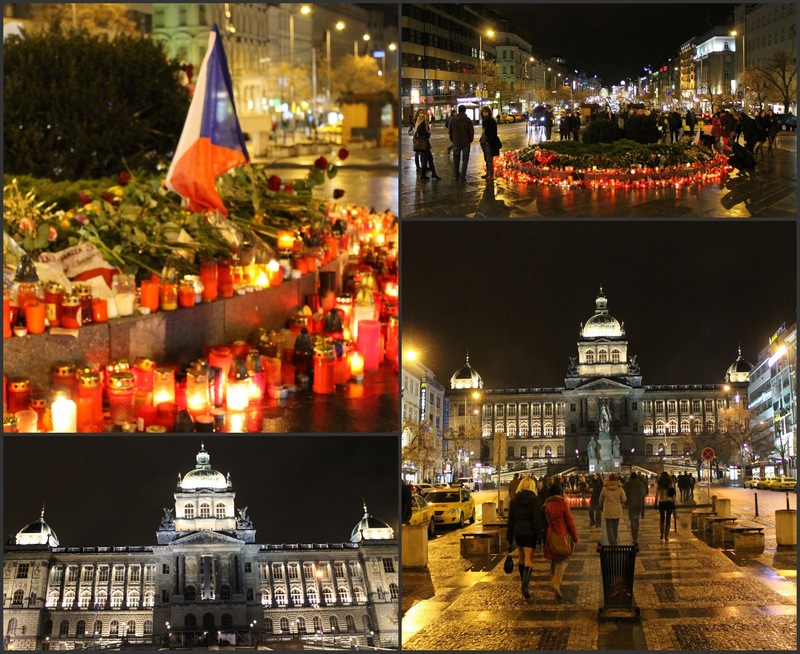 The candles are because Vaclav Havel (the first leader after the Velvet Revolution) died earlier that week. So. Sorry that was forever long. Stay tuned to hear about an actual day in Prague tomorrow. Oh! 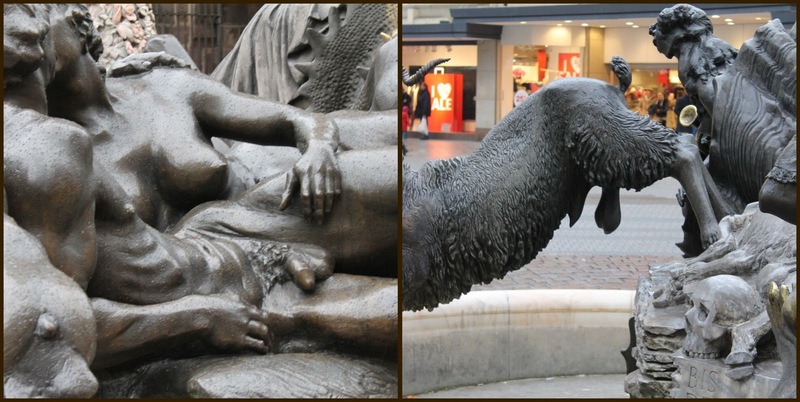 And before I leave... can someone please explain this fountain in Nuremberg? Or am I the only one that thinks it's a little weird/odd/awkward? OMG, I am dying to go to Prague!!! Thanks for sharing all your pictures! What fantastic pictures! Looks like a great trip! And the food you described sounds delicious! Oh my gosh I'm so glad you found my blog I just totally blog stalked you ;P What brought you guys to Germany? (you've probably blogged about it so I'll take a gander in a few haha) Well that's awesome and I'm jealous I look forward to getting to know you, you seem super sweet! Oh and thanks for the congrats :D We should totally swap buttons I'll e-mail you in a few. Ahh! 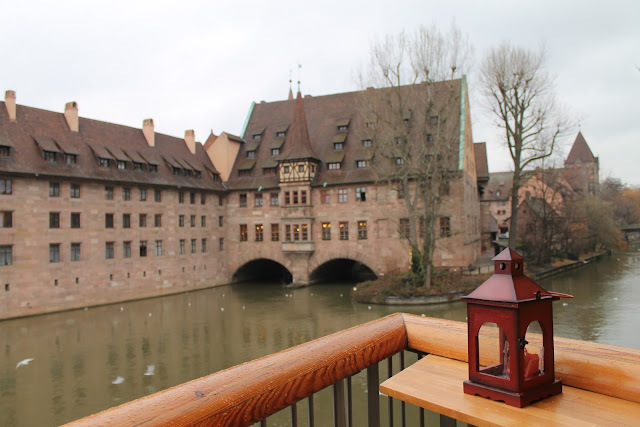 You know how I feel about Nürnberg! Love love love! So jealous of your exciting travels. Hopefully me and the hubs will get to visit Prague as well! Be safe! I love the jumping picture haha, it looks like you've been having an awesome time and it all looks beautiful! i went to prague in june, for work, but took a few personal days as well, and i absolutely fell in love! Hi there! 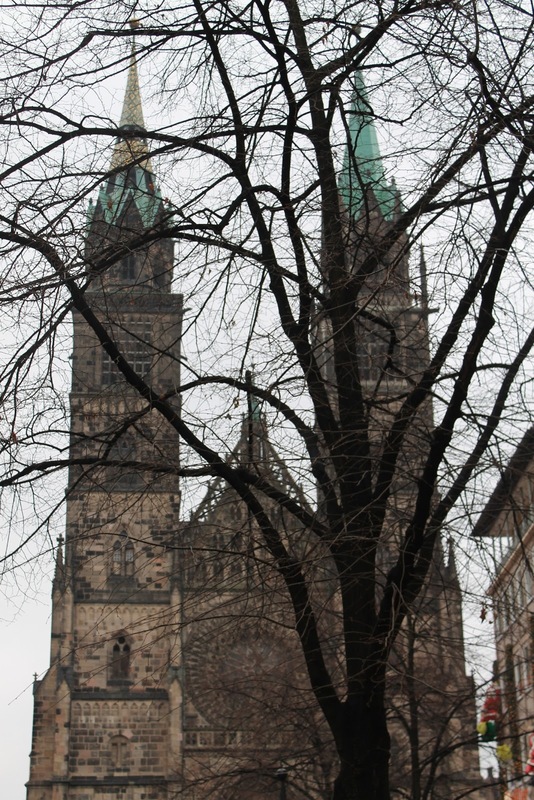 I just stumbled across your blog somehow and I have to say that 1) Prague is the greatest city ever (I lived there so I'm not biased at all), and 2) I live in Nuremberg now and I *think* that statue tells a story about love. At least, that's what I've been told... I'm not sure how lizards factor in, but who knows.